Considering that one spends a third of one’s life in bed, selection of the right mattresses and pillows should be given the deliberation it deserves. Read the article mention below to get complete information on How to choose comfortable bedmate? That makes your sleep comfortable and healthy. The main function of the mattress is to serve as a comfortable and secure base for the resting body and make your sleep more comfortable and healthy as well. Good mattresses provides firm, horizontal support to the body, while yielding to its natural contours which gives rest to the muscles without causing strains and aches. Never use the mattress that sags in the middle as it restricts blood circulation and natural body movement always use firm mattress which provide better support to your back than the soft one. Choosing the right size mattresses: Ideally, a mattress should be 6" to 8" longer than the sleeper. To determine the right breadth, stretch out with your hands clasped under your head. The mattress should be broad enough so that the elbows do not protrude out of the bed. Most Common Mattress Sizes available in the market are given below; you can choose any of them according to your bed size and your body size. You can also go for customize mattresses which can be made according to your body requirements. There are many types of bed mattresses available in the market like spring mattress, natural latex rubber foam mattress, Air Mattresses, old fashioned stuffed mattress and lots more, let us read about the Types of bed mattresses available in the market. Old fashioned stuffed mattress for bed are most common type of bed mattress used in India is stuffed mattress usually filled with cotton of varying qualities, or with silk cotton, or natural fibers such as coconut coir and even pine needles in the hilly regions. These type of mattress are very economical than the other type of mattress available in the market and the support they provide is depends on the resilience of the filling. A stuffed mattress can have a long life but needs to be cared at required intervals to smoothen out the unevenness caused by lumped cotton, and to rejuvenate its springiness. 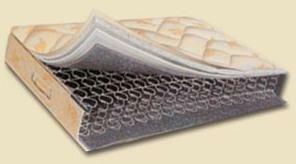 Spring Mattress essentially consist of coiled spring between layers of insulating material. A well sprung mattress will flex to fit body contours and movement naturally, giving the body required support. The denser the springs better the quality and durability of the mattress. It is recommended to have 288 spring in a 41/2' x 6' bed, but the best mattress can have 1,000 of spring in it. 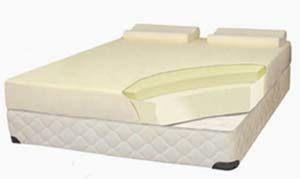 Pocket sprung mattress, in this mattress the springs are sewn into individual fabric pockets for better support to your body, as each coil absorbs the weight individually. This type of mattress becomes very popular now days because of its unmatched qualities and long durability. Memory foam mattress/ memory mattress are topped with a layer of temperature-sensitive visco-elastic material popularly known as memory foam because it is very slow to return to its original shape, thereby "remembering" the shape and contours of your body. Memory foam consists of billions of little air-filled cells which decompress under pressure, particularly if the pressure is accompanied by heat. Thus, when you lie down on a memory foam mattress, the foam cells closest to your body slowly release their air, creating a unique melting effect and allowing the mattress to conform to the shape of your body and when you get up, the foam cells slowly refill with air, which is why it takes a few moments for the mattress to return to its original shape. Memory foam mattress reduces air circulation around your body, which makes the memory mattress feel warmer which is helpful in winter, especially because you can't use an electric under blanket with memory foam mattresses. But you may feel too hot in summer. This type of mattress is good at relieving pressure on painful joints, but is usually pricier than sprung mattresses. Natural latex rubber foam mattress are made from natural rubber or latex, looks like a honey comb with hundreds of air holes which gives it its cushioning effect. The quality of this mattress varies with the quantity of latex. Ideally a good rubber foam mattress should be made of 100% latex but being expensive, cheaper fillers such as liquid clay, plaster of paris are often mixed in making the resulting latex less costly, but also stiffer and less durable. Now a day's manufactures use blends of natural and synthetic latex to capture the advantages of both natural and synthetic latex and thus have become quite popular. Coir foam mattress are well known for the features like good comfort level, durable, Light in weight and Excellent finish. These mattresses are made up of coir (coconut fiber) and rubber which is compressed into sheets of different sizes. This type of mattress is very popular in India. There are many benefits of coir mattress like these are Heat and moisture resistant, provide good ventilation, moth proof, flame retardant and excellent insulator. Air mattress has unique air-filled core which is connected to an electric air pump, which is located either inside or underneath the bed, and is operated via a remote control. These Air chambers are made from either vinyl or rubber with tight seal to minimize leakage. These mattresses can be configured to a precise level of desired firmness, or even different levels of firmness on each side of the mattress. Waterbed mattress are not very popular but these are the perfect solution because they offered even support which depends on how full the mattress is of water, so keep it topped up. Waterbed mattresses have a very unique feature that their temperature can be controlled so it is a perfect mattress for the people living in cold regions. Water beds are recommended for allergic people as the bed can be cleaned very easily with just a wipe. You can choose any of the above mentioned mattresses for your bed according to your requirement and budget but make sure that your new sleep set comes with a warranty that protects you against manufacturer defects.